I finished my first baby kimono last week. 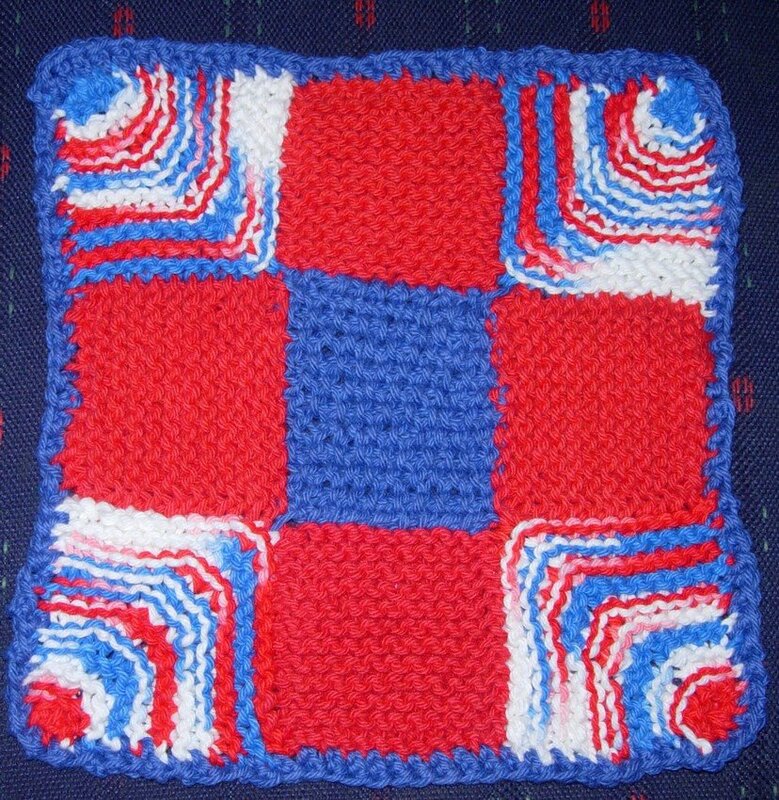 I followed the pattern using SNC in "Cream". It was leftover from my Absorba. The ribbon is too wide (3/4"), but I couldn't help using it because the colors will match perfectly with their baby's room. Next time I'm going with 1/2". The cool thing is that I sewed the ribbons on Thursday, and then on Friday morning I got an email announcing that the baby was born on Thursday around the same time. Thanks for waiting, baby! This is my first post but I have loved seeing all the other projects. Many of the world's sinks have been spruced up with all the ballbands people have been knitting. I am on my third and I will now try to post a pick of number 2. Number one went to Boston as a housewarming gift before I thought to take a photo of it. 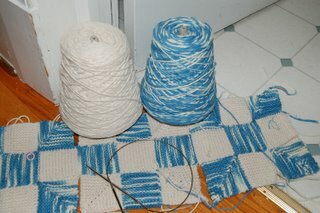 I have also started the potholder loop rug and Moderne blanket. Who on the KAL knits a BallBand Warshrag the fastest? Now, I feel like I'm a slow knitter and I started and finished two this weekend. I estimate that each one took me, altogether, about 3.5 hours of uninterrupted knitting time. What about you? Oh, and who's knit the MOST BallBands? I've only knit about 10. I know someone out there must have knit about, like, 100. Speak up! I was wondering if anyone knew whether you're supposed to sew the ends of your strips of fabric when making a rag ball--or tie the ends? I am thinking about making the Dizzy Rug on page 96 but will almost certainly not be spending the time searching thrift and antique shops for rag balls. Any advice on rag ball-making would be most welcome! 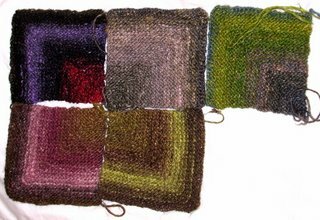 I decided I couldn't handle the wonkiness of my mitered stockinette squares so I am in the process of redoing all of them (and more!) garter stitched. 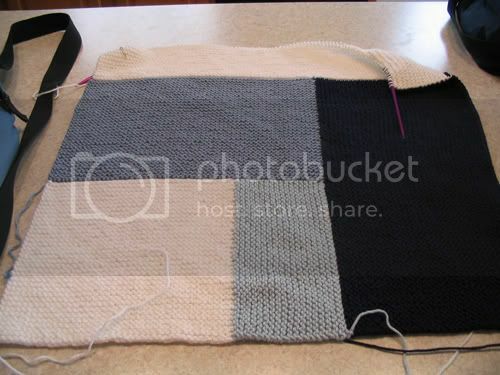 I am using a size 7 needle, casting on 52 stitches, and k2tog-ging twice on the even-numbered rows. 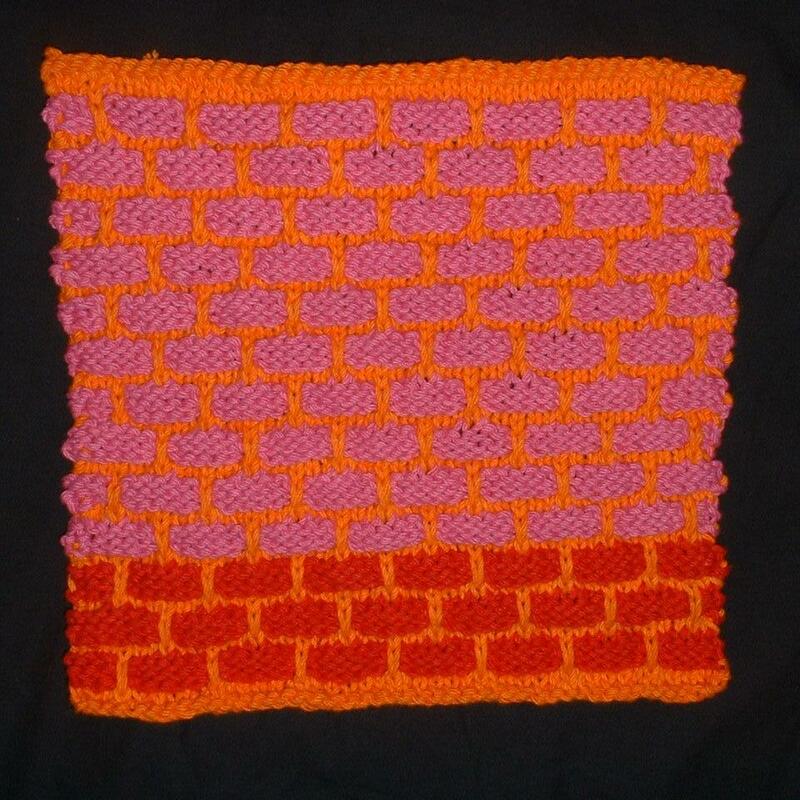 The result: square squares. Please check out the site Mason Dixon SwapCloth if you are interested in joining the swap! 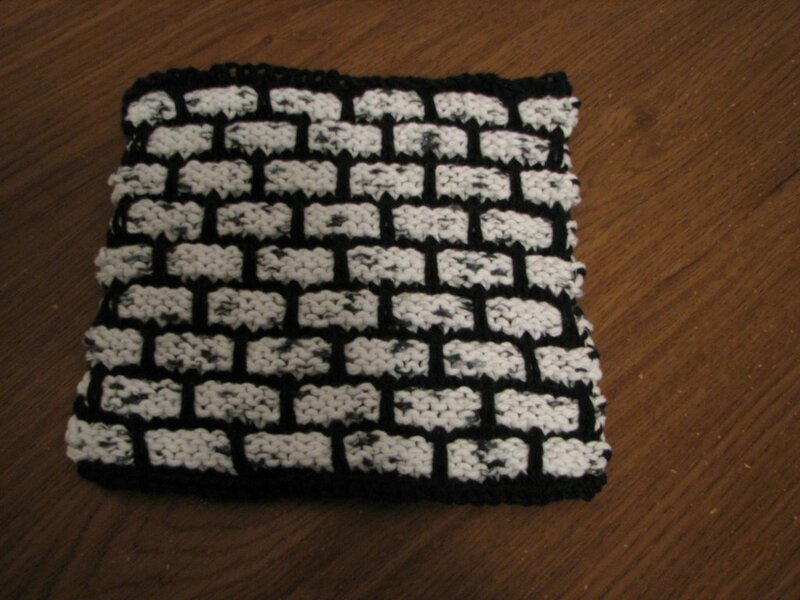 Another ballband warshrag. Same colors as my ballband kimono posted earlier this month. But the colors are used in differently here. The red was the background in the kimono, the orange is the background here. The yarns are Sugar and Cream red, hot pink, and pumpkin. Explanation/Instructions are a bit long-winded and photo-dense, so I won't duplicate them here (bandwidth! ), as they are already here (part 1) and here (part 2). I remember reading that the colors of PnC/SnC cotton could be made somewhat more colorfast by washing in vinegar before the first use. Does anyone have specific instructions for how to do this? Soak in pure vinegar then rinse in water? Detergent or no? Or is there a water/vinegar ratio to use when washing in detergent? Or something else? I love the bright colors of my PnC/SnC warshrags, bibs, baby kimonos, etc and would love to keep them looking like that as long as possible. The hand towels for my friend's wedding were finished and were given to her on her wedding! This is impressive because the last gift I gave to friends who were getting married, I was forced to give it to them much much much later than their wedding. They came out really well and are highly absorbent based upon the fact that they took forever to dry once I washed them. But Mom was awesome and waited till they were dry then dropped them off at the reception for me! She even wrapped them individually and then put them in the gift bag I had prepared. Mom's great! 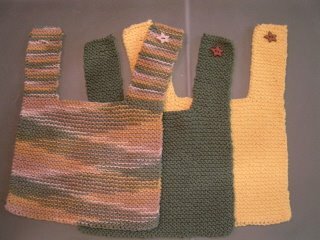 I really loved knitting these. 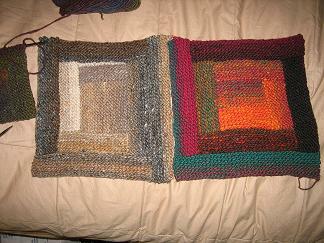 The first one took the longest because each one i knit after that first one got the pattern a little more in my head. After the second one, I wasn't even looking at the pattern as I knit it. I'm also really glad that I knit each one a different color. 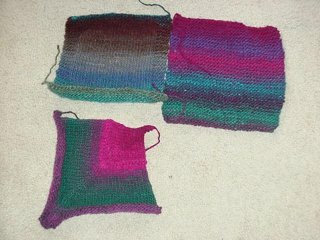 I found that my mood changed depending on which one I was knititng. The blue one felt like it was the longest. It actually made me feel somewhat sad. I was inspired by the tan one and the green one really made me happy. I don't think I spent enough time on the red one to really get a whole mood going, but it made me think alot about how I was almost done and how the three of them as a gift were going to be great. Surprisingly, I didn't have a hard time knitting with the linen. I rather liked the texture, and that it got softer as I kept knitting with it because the yarn was in my bag all the time and rubbing against anything it could rub against to get softer. 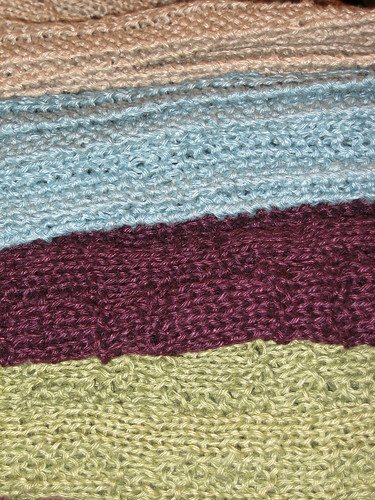 Also, the project I worked on right after this project was made with Misti Cotton - a pima cotton and silk blend that felt all the more softer after knitting with corse linen. All in all, I give the pattern two thumbs up! I'm attempting the 9 square dishcloth but for some reason my mitred square is waaaaay longer than the other squares on the cloth. What am I doing wrong? Should I switch to smaller needles? Am I knitting too loose (which is rarely a problem for me but who knows!)?? Does it just need to be blocked?? 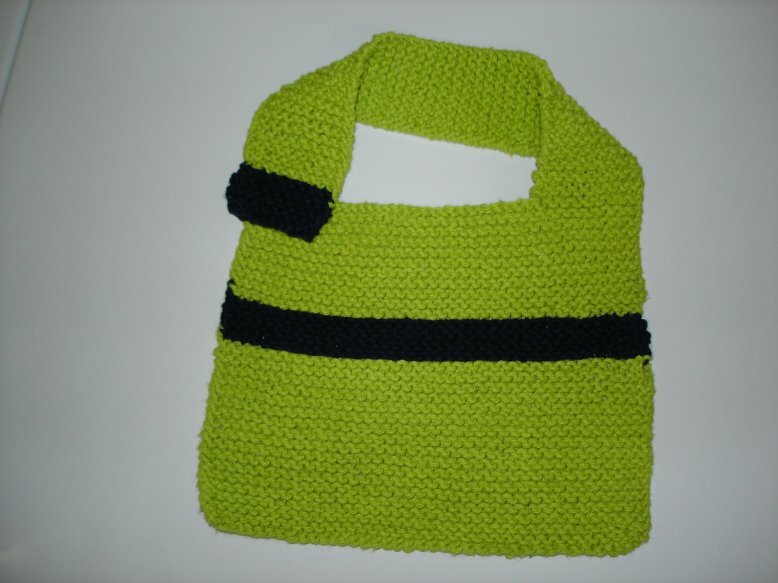 And also, if I wanted a sturdier / thicker buttonhole bag, how would I do that? Three strands? I think my wallet and phone is too heavy for the one I just made. I gave a couple warshrags to my granny, and my mom has been carryin' on about how great and awesome they are. So for her 60th birthday next month, I'm making her a giftset! 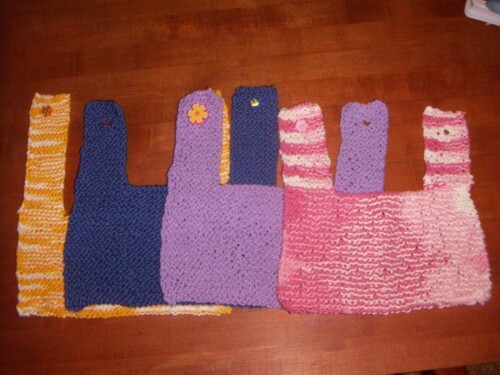 I'm using the colors of her bathroom and making 2 warshrags and a handtowel all in different patterns. I like that they're not alike, but matching nonetheless. I posted a comment in Christina's post below, but I thought some might benefit from an actual post regarding uploading photos, and helping ease the bandwidth issue here. I upload all my photos for here and my personal blog at photobucket, and it has many advantages. It seems to me to upload photos much faster, and eats up very little bandwidth vs. uploading directly to blogger. For those of you who are like me, and need the computer language play by play:You must create a free photobucket account, upload your chosen photos, then cut and paste the img src code underneath the thumbnail for the uploaded photo where you want the photo in your post. If you then click over to compose from the edit html screen, you may have to resize your photo. I just use the click and drag method by clicking on one corner and downsizing the photo to the correct size. It's really fast and easy. I just wanted to thank Christina for hosting, and all the headaches she must have; I hope this helps. I know there are other sites out there that offer similar services, such as flickr. I don't have firsthand experience w/ them, but I'm sure folks around here have plenty of advice! If most folks upload w/ another service and use html codes to post the pics, I'm sure we won't have the problem of seeing little x's on photos we all would love to see, but can't because of bandwidth issues. Happy MD knitting to all! This is my first post here at the KAL. 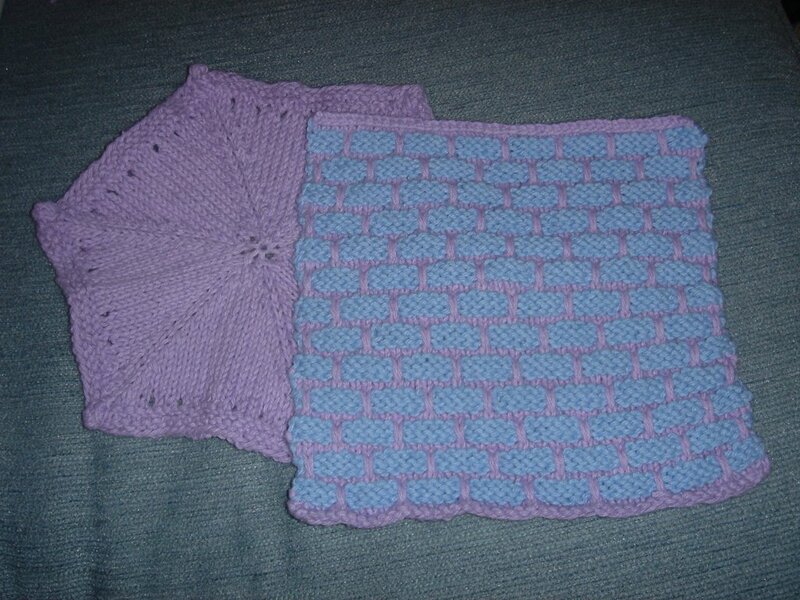 I've made two dish/washcloths. I really liked the two color one, and I love the mitered ones people have been doing. My circular one turned out ok, but I think I prefer the more mindless knitting for these, since I have enough other projects where I need to follow patterns. Anyway, here's the pic of my projects! Just wondering if anyone knows how long the Michael's sale is going to last? Everyone's projects look great! I'll be posting some kimonos and who knows what at some point in the near future. "F" is for felting and fun!!!! 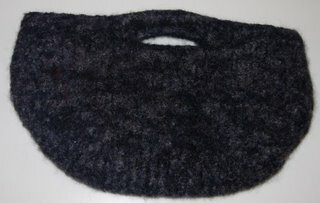 This is my first buttonhole bag, and my first felting project. Things were a bit apprehensive there for a while, until I remembered that felting is shrinking, so that huge loose blobby thing would probably become something a bit neater looking. And it did! I used two strands of Cascade 220 on size 13's - I think I could almost promise you'll get a whole bag out of just one skein. The darker color doesn't show well in this pic, but it's actually a "mallard green" heather. I did felt this bag twice, because I wanted to know what would happen, mostly. I think once was enough...I can't prove it wasn't this way after the first time, but it did end up with the increase bump on the left being at a different height than the increase bump on the right. I wonder if I made a mistake, or if the felting just made that happen? Otherwise, it's a great bag, and I even like the size. I might like my next one a little smaller, but I'm not entirely certain how to make that happen. There's plenty more Cascade left to find out! 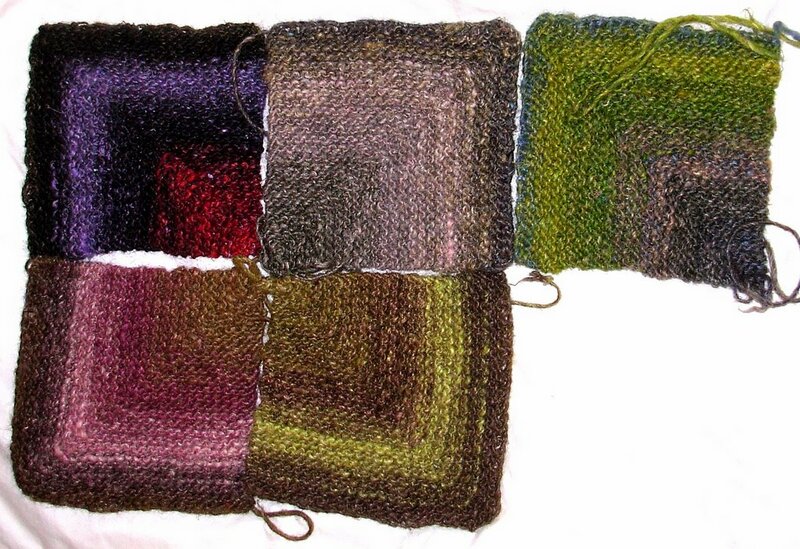 For the heck of it, here's a pic of a couple Noro Log Cabin squares for the blanket I'm working on. I tried to post these a while ago, and Blogger just wouldn't have it. Now I've got four done, and several more skeins in the stash. These are about 9 in. sq. Also working on a Moderne blanket in Silky Wool, but there's not enough of it to post. 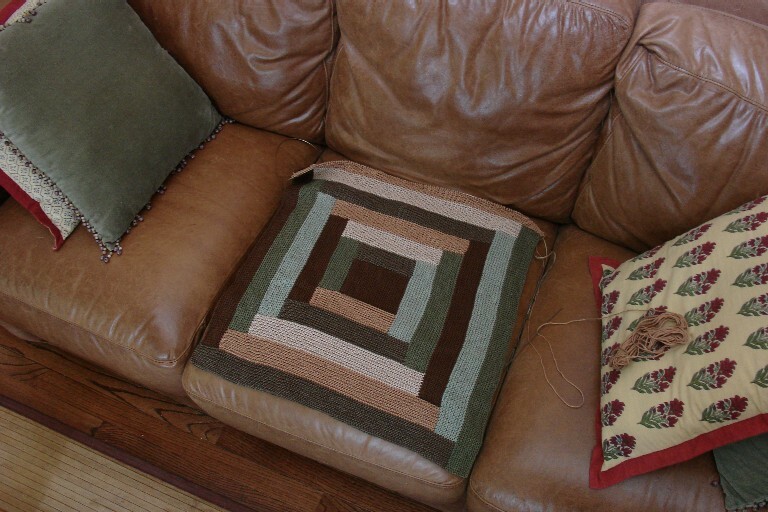 AND I'm making one of those cool circle-of-fun rugs out of SNC. It's progressing quickly, but I'm gonna make myself finish the Fetching Hand warmers from Knitty tomorrow. We're moving to Indy in just a couple weeks, and then I have to return to school after a long year off...while I'm glad to be going back, between moving - which I am still avoiding packing for - and classes and work, I can just feel my knitting time running out! I was enthralled with the afghan made up entirely of Noro yarn squares (Afghans for Afghans charity project) and decided that I had to have one too! But since I am on a budget, it might take awhile. I decided to use up the odd leftover in my stash and pick up more skeins as they come on sale or go into the "reduced" bin at my LYS. 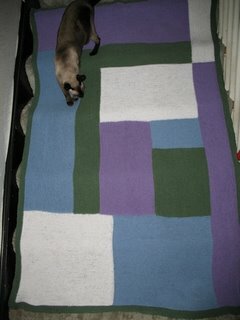 I figured I would make it a "sampler" afghan, with different patterns. Here are the first 3 squares. My blog , if y'all are interested. I'm having a hard time deciding what color to match with this SnC Natural Ombre for a ballband washcloth. Any suggestions? I just hit the Michael's $1 sale, so I have lots of options! I love the big Dotty cushion in the book but didn't like the idea of doing them on size 3's and I'm not sure I like the linen yarn it seems stiff and not soft . 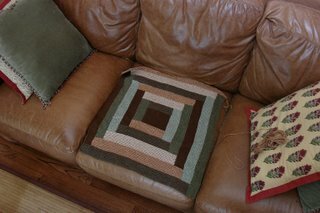 Well there is a new big dotty chair cushion on the mason dixon site and she has used my favorite cotton classic doubled on big needled. I love it!! AHHH but I really really shouldn't start a new project. I have to finish something first. Back to mitered squares. The yellow bib was done with Lion Cotton, the blue w/ fantasy naturale & the purple & pink were done with sugar & cream. I started to knit up the baby kimono and began casting on for the sleeves and I got so frustrated I frogged them and turned it into a bib. I'm a relatively new knitter, so maybe I'm doing something wrong. I know how to do the stitch, but they are so wonky and loose that it just looks awful! Do I have to use the backward loop method or is there another stitch that is more stable that I can use? If I have to use that method, what can I do to make it look better? Thanks in advance for your help! I'll post pics of my items soon. I live in the boonies, (Boone to be exact) and we only have WAL-MART. I'm looking for the best "deal" on SNC online. JoAnn's seems more expensive($2.19) than Michael's ($1.49) but looks like I can't order online there. Where can I get it online (other than JoAnn's)?? These are the bibs I did for my brand new nephew and godson Jack. I used Sugar n' Cream and star buttons that I got at Michaels. 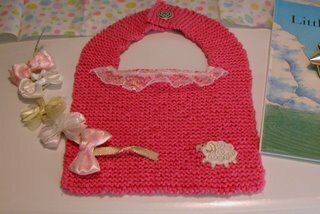 I really liked how they came out and I am going to make more just to have on hand for last minute baby gifts. I am excited to start experimenting with different colors to see how they come out. My first MD Ballband warshcloth didn't take very long. I started it about 3 PM and was finished up right after dinner (around 8). I made mine a little smaller (33 stitches instead of 45). I like smaller cloths. They are easier to wring out. I cast on for the "opposite" colorway. I'm one repeat in and I'm not sure I like it. It may be frogged back by tomorrow. Hope everyone has a great weekend ...happy knitting. After I made my first ninepatch dishcloth, I couldn’t get the idea of a ninepatch quilt out of my head. 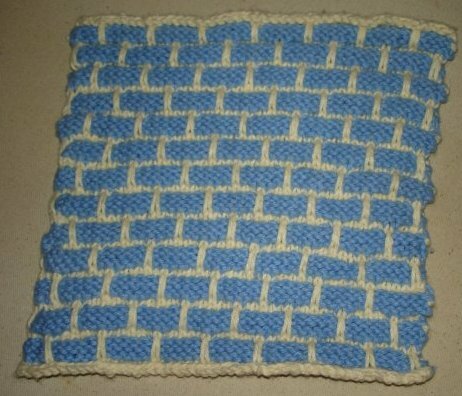 Or, as it turns out, a ninepatch rug/mat for a blue and white bathroom. More photos and the process so far on my blog. Also – has anyone used Cherry Tree Hill North Country Cotton for the kimono yet? I found a hank of Wild Cherry in a sale basket this week – gorgeous colors! – any advice? Thanks, Kelly. Tracey of Knitting Kneedles and I (Holly of HollYarns) are working on pulling together a knitting swap for all the loyal fans of Mason Dixon Knitting. As we've both been busy (Tracey with an interstate move) and me with whining about the California Not-A-Dream-Heat-Wave, we've just started working on organizing it. As Tracey mentioned in a previous post, if you'd like to join, please email her at romiettah AT gmail DOT com. We will get back with you all with more info as soon as possible. 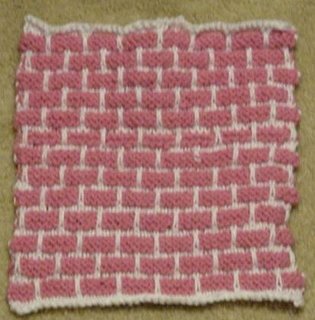 And as soon as we get the site going for that swap, I'll post the details there for my "Miter Been Crazy" washcloth for those who've been asking for the pattern. Finished the first and now on to number 2! I took someone's advice and switched the colors for warshrag #2. I can now be found in the park on my lunch break knitting warshrags while the mommies looking on in amazement. I better hide them before my mother-in-law comes to visit Saturday! Just got an e-mail from Knitch in Atlanta and passing it along. Their website is www.knitchknitting.com and they are in Virgina Highlands. This is a FABULOUS new yarn store!!!! "For all you Mason Dixon Knitters out there...We've received a huge shipment of Peaches & Cream in both 1 lb cones and 71gram balls From Elmore-Pisgah,one of the last surviving cotton mills in the US.Peaches & Cream comes in a wide range of colors! Welove this cotton for its versatility and we love MasonDixon for it's quirkiness. 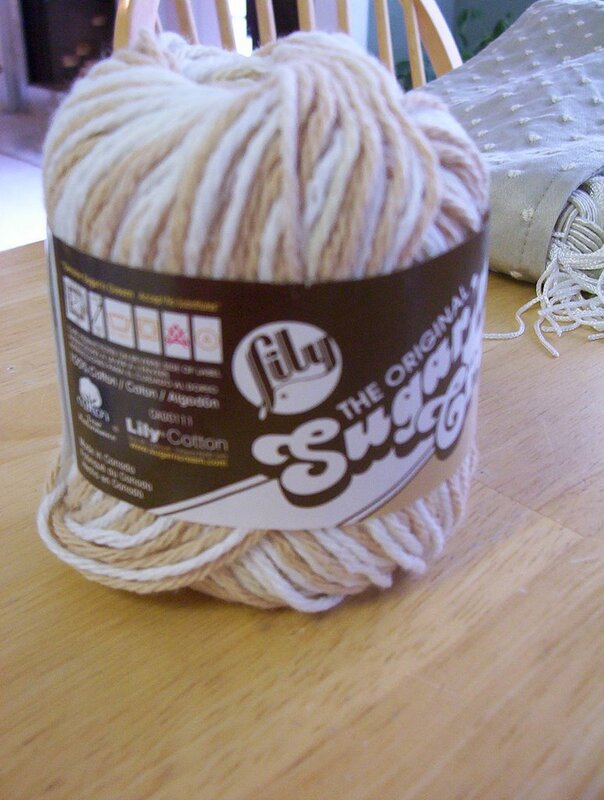 We'll be starting our MasonDixon Knit Along each Friday night in August so besure to stock up on Peaches & Cream now!" Yes, another washcloth. And, yes, there's already another one on the needles. They're the perfect break from all of the stockinette I have going on elsewhere, and they certainly are a quick fix. I made a few very tiny changes in this one -- only cast on 33 stitches, and only 11 "waffle lines" long. My hands are really small, and this seems to make the perfect size. Also, I soaked this one in vinegar and water to see if it'll hold its color a little better. If not, that's OK. I'll love it anyway. MDK ers--and Cristina, I hope you don't have to delete this because it is related to mdk--I'm in Korea on an extended business trip, anyone have a LYS here? Need more cotton for mitres and logs? 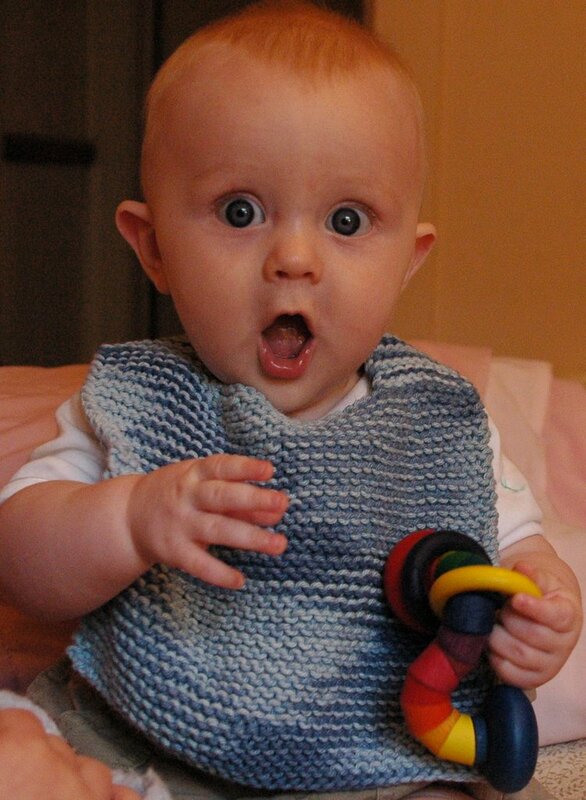 was enjoying reading my awesome new book when I got a phone call reminding me of a baby party. 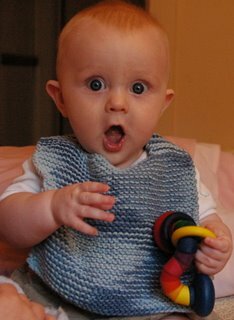 I remembered to get a gift but forgot to make something knitted? This book sure was perfect timing. It has lots of fun, practical and quick baby things to knit. 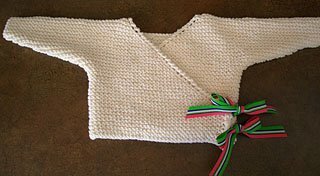 This little cotton tots bib took no time at all and was fun to knit up. 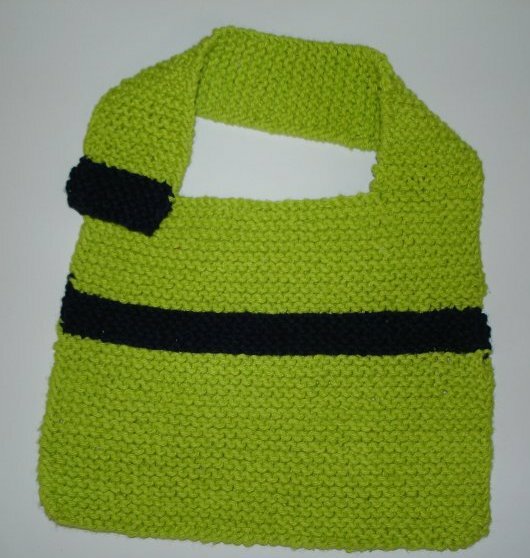 Now I am off to make some wash cloths! I bought the yarn to make a rug and after reading through the pattern have a question. When it says so many garter ridges does it mean every two rows of knitting? 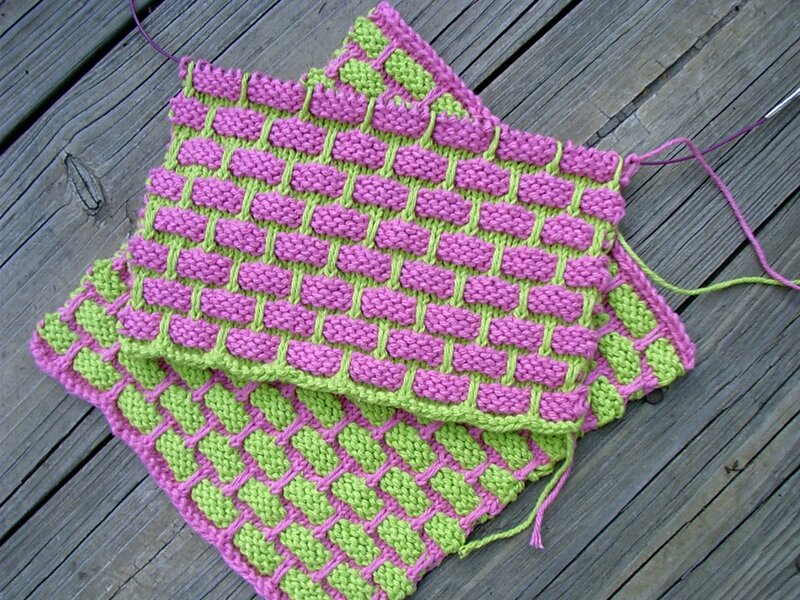 I know the garter bumps or ridges show up on the second row of knitting, but wasn't quite sure how to count by rows. Can anyone help me? 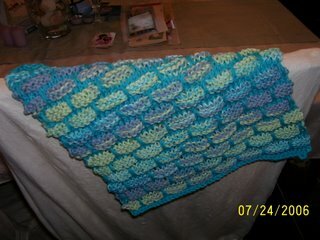 Just finished up my third Absorba. I think I like this one best of the three -- the edges came out the most even, and I feel like I've really gotten the design down pat. 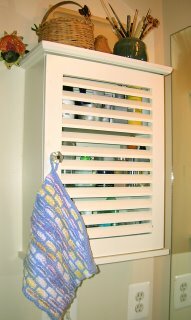 I've pretty much decided on bath sets -- mat, hand towels and washcloths -- for Christmas gifts. Now I just need to figure out which design to use for the sets. If I use Absorba for the mat, I'll have to make the towels and washcloths in log cabin. 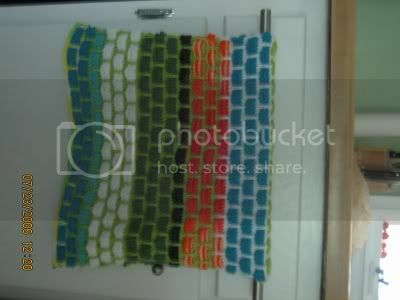 On the other hand, I could make ballband washcloths and towels and then try to adapt that design to a bathmat...maybe using 3 or 4 strands at a time like with an Absorba. 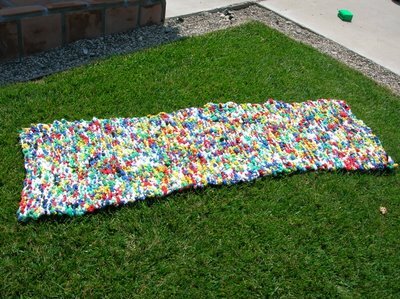 Has anyone on the list tried making a ballband bath mat? If so, how did you like it? I was online at Smiley's Yarns this morning buying some yarn when I noticed they're selling some cotton yarn by Lily, but it's not Sugar 'n Cream. They have Lily Elite Cotton. I immediately thought of MDK and how a finer cotton would be more suitable for face cloths and hand towels. But has anyone tried it before? I didn't order any and now I wish I had. I'm giving up now. 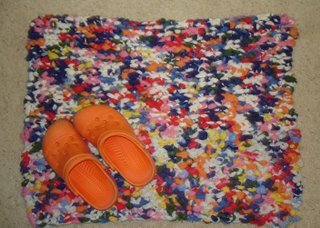 I've tried to upload a picture of my circle of fun bathmat, but blogger will not do it. So please have a look here . 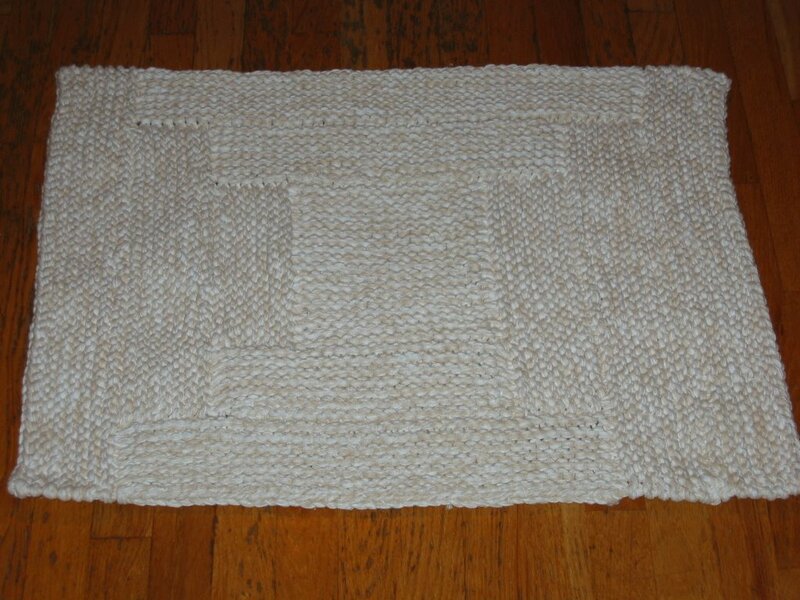 I finished the potholder loop rug yesterday. I'm really happy with it. The rug measures 24 inches by about 68 inches. 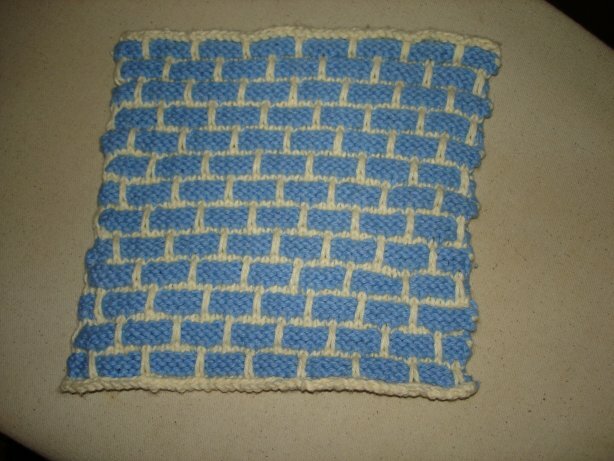 I loved knitting with potholder loops becasue it knitted up so fast. The potholder loops made a really affordable hallway rug. In all I used thirteen 10 oz bags of cotton blend loops. I just need to go out and buy a rug pad to put under it to keep it from sliding around the hallway. Bernat's Handcrafter's Cotton works just as well as Sugar n Cream and Peaches and Cream and it comes in big (i believe 12oz) skeins at A.C. Moore for 9.99.
just thought i'd give you all the head's up. My first post! Hi all, I've been trying to finish up a couple of MDK items before I posted. So, here they are. There were some questions in the comments on my technique of keeping the live sts on circular needles. Enlarge the picture so you can see better. You can see that each center section on each side is on a separate circular needle with point protectors on them. Try to use a fairly long ones so the ends stay out of your way. I will be using longer ones as it gets larger. The red section on the right is just started and has one ridge done. You can see that I have picked up the pink and dk green sts on either side of the center sts. The first ridge might be a bit fiddly but it settles down and you can push the ends of the other needles out of the way. So, when you start a new band, pick up the end sts from the previous band on each side of your live stitches and put them on the circular needle. For the right side, I use a double pointed needle so I can see what I'm doing and transfer them to the circular needle. With the left side you can just use the circ to pick them up. 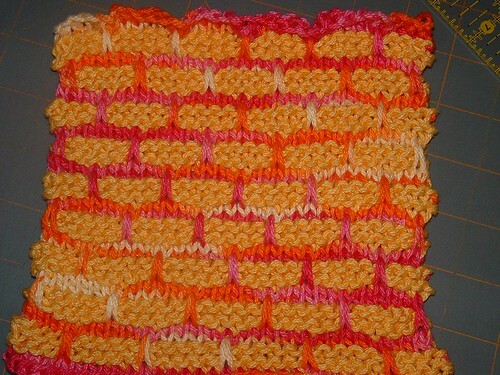 Just slide the circular needle through the "bumps' at the end of each row. If you have 9 ridges, you will have 9 sts to pick up. 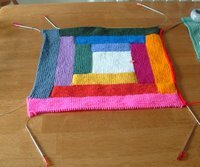 You will then start at the right side and knit all sts. 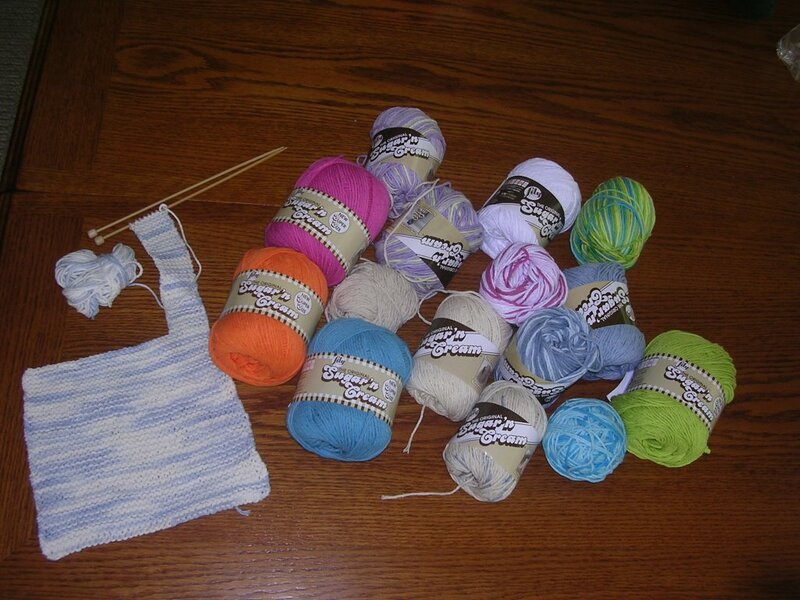 You are not picking up as if to knit but just sliding the sts onto the needle so no sts have been worked yet. You don't need a 5th needle. You just use the end of the needle that is holding the center sts, picking up the sts left and right so they are all on the needle, then just knit the band. When you are finished, end with a wrong side row and cap the needle ends with the needle protectors from the next band. Clear as mud? The marker you see on the white square tells me that it's the top and that and the opposite end will get 10 ridges. The side bands get 9 ridges so it will be rectangular. I don't think getting cord at the hardware store might be a good solution as you would have no point to get the sts onto the needle. It's the same as if you would put all your sts on a strand of yarn. You would still have to transfer them to the needle. This way, they are already on the needle. 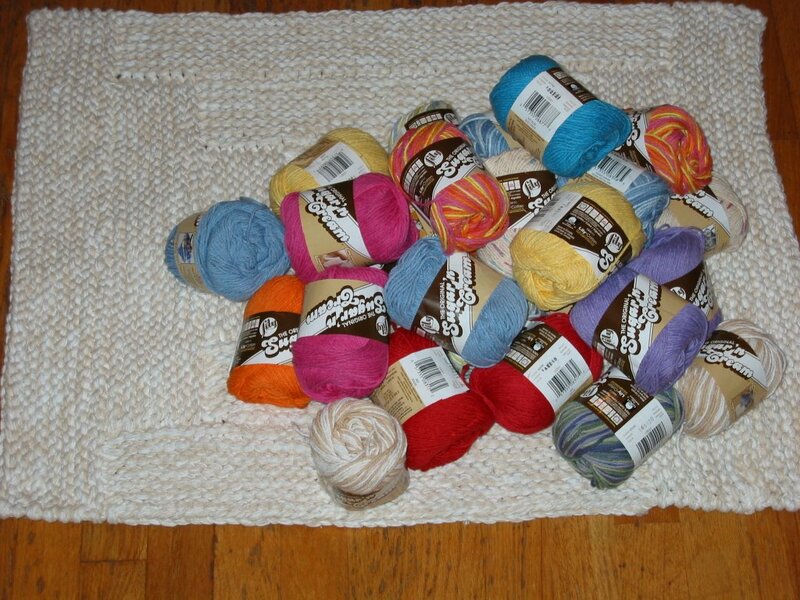 If you have any questions you can email me at jlhknits AT earthlink DOT net. 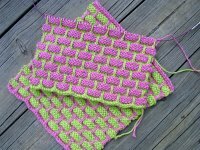 notes: never thought I would cast on for a dishcloth (or two), but the pattern and the yarn make this economical and addictive, as well as practical! 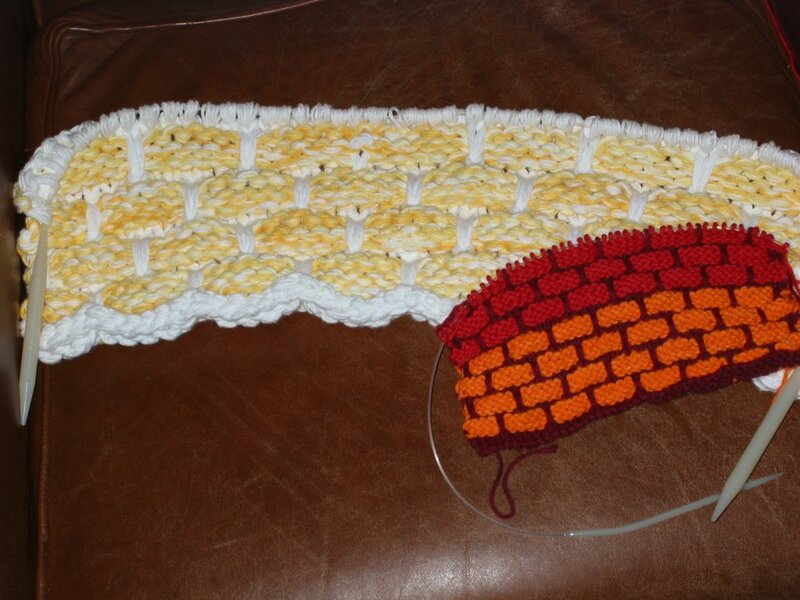 This is my 'stash' of Sugar and Cream yarn and a bib that is ALMOST finished. I keep forgetting about it! My family is going camping this weekend, so I will just take this whole stash and my Mason Dixon Knitting book and get busy! So after lurking and lusting here and on the Mason-Dixon blog I finally broke down and bought the book. (This means a lot, mind you, since I'm currently unemployed.) So howdy everyone! 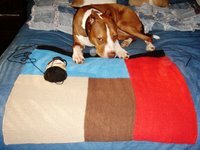 I've knitted for 20-odd years, but never used cotton or made "home-goods" before. Now I'm suddenly craving pot-holder loops and eyeing all my old T-shirts while visions of rag rugs dance in my head. 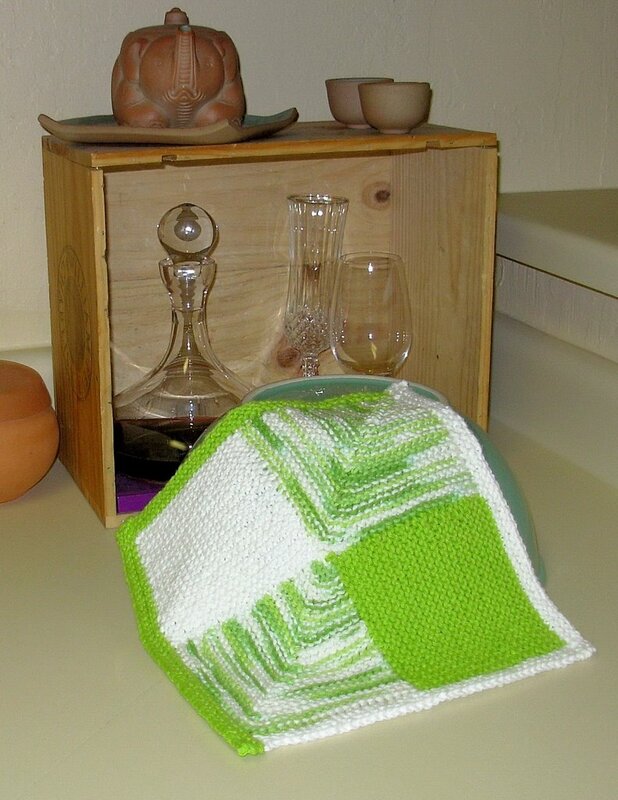 Here's an action shot of my first ball-band washcloth, done in Lily Sugar & Cream. Since these will be used as my daily face towels, and won't get soaking-heavy wet, I chained a nifty little loop hanger after finishing the bind-off. Anyone out there familiar with both the S&C and the P&C cotton? None of my local stores have the P&C but I will gladly order online if there's a difference in quality/softness. I want them to be nice and soft for sensitive skin. Opinions? OK, enough yakity yak -- I can get a few more pattern repeats in before starting dinner! Thought it was time I'd post a photo or two. Two of the ball band dishclothes. 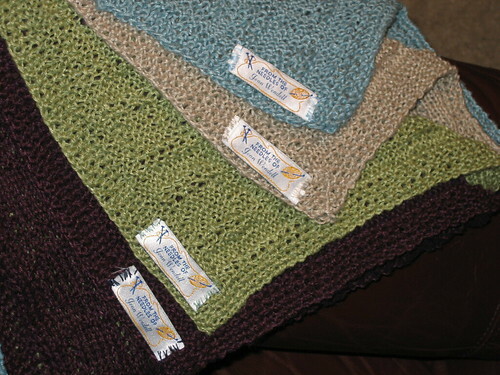 It's the first time I've ever knitted a dishcloth (I usually crochet them) & I admit, I love these! 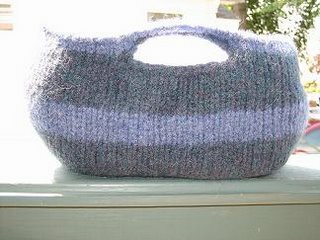 They are fun to knit, they aren't boring, they're done pretty fast, it's great to play with colors &/or use up scraps of cotton, and of course, they are great to have around the house! 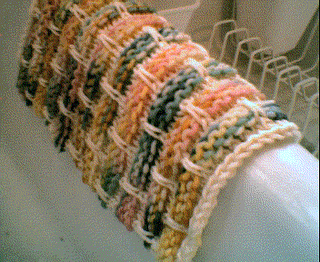 The 9 patch dishcloth, using yellow & white. 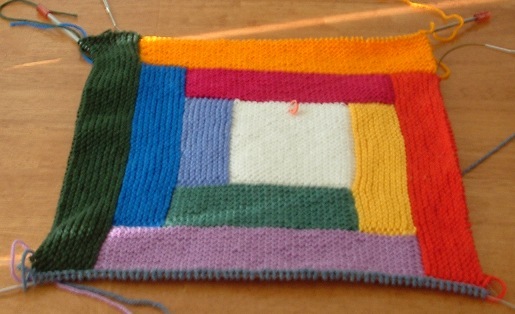 I didn't bother to do the fiddly purl on the wrong side of the cloth. I just did a sc border all the way around to help complete the finish. I also knitted up a button hole bag, but I need to felt it first. I started the Log Cabin from Mason-Dixon Knitting and can't put it down! Click to enlarge pictures. I sorted my yarns into warm and cool colors and they seem to be working just fine. I am doing some things a little differently. Instead of binding off each edge and having to pick the stitches up again, I leave them on a circular needle. That way when I come around to another band, I can pick up the end sts from the previous bands and just knit the live stitches. It looks more like a continuati on of the stitches. So I have the stitches on four circular needles. 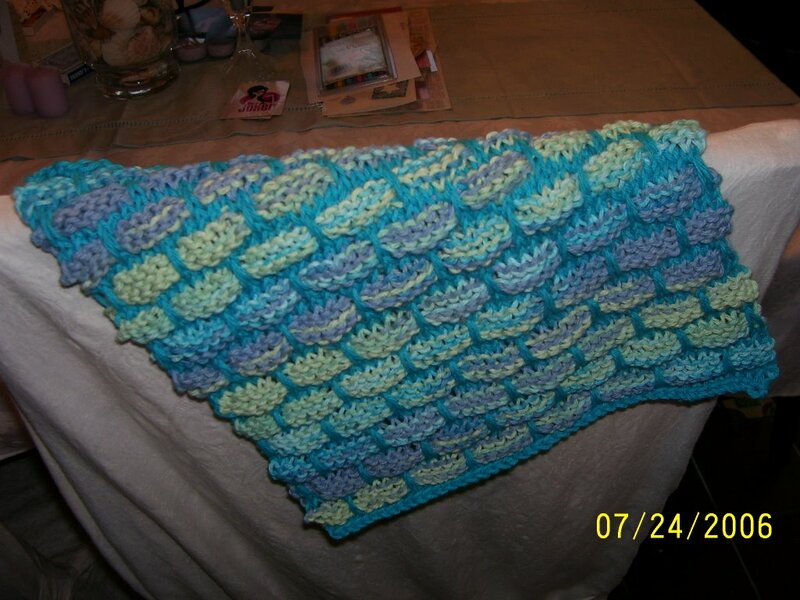 Also, I wanted a rectangular afghan so I'm doing 9 ridges on the side pieces and 10 ridges top and bottom. The one extra ridge will make a difference as it gets bigger. I'm not sure how big this will end up, but I may have to use two circulars on each section to hold the stitches toward the end. I'm using a #7 needle and seem to have lots of those so not a problem. This is a project where you want to do just one more section at midnight before going to bed! This is in Elann Sonata again. I know some people have been keeping the stitches live rather than casting off and picking up. 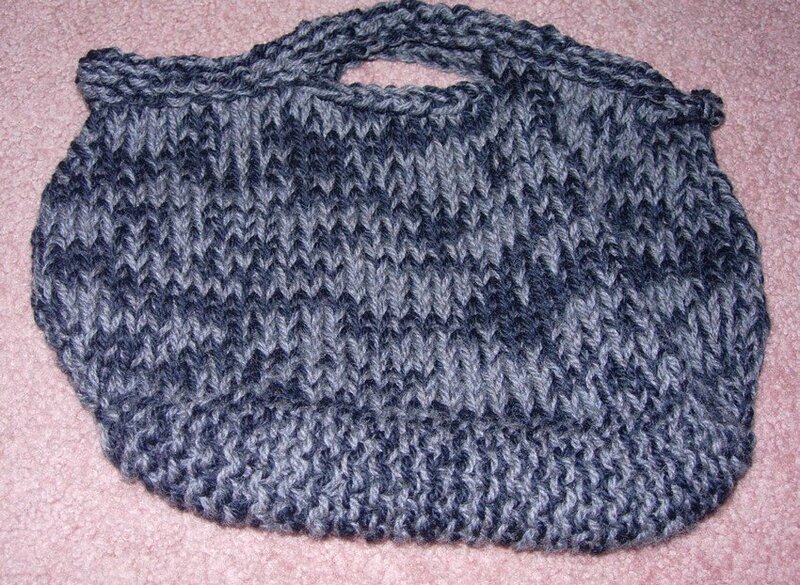 I haven't done that because I really like the "put together" effect you get when you bind off and pick up stitches. I think it mimics the feel of a quilted Log Cabin better. NAKED NEEDLES!!! I'd better cast on another one right away! I've been sewing alot lately too as it's really hot in Atlanta (I know - some of you are hotter and hey at least we've got AC unlike all those folks in the Pacific NW), and I have a shoulder injury that knitting aggravates so... But that's ok - I've made lots of little bags to carry the ballband projects around in and I'm having a blast. 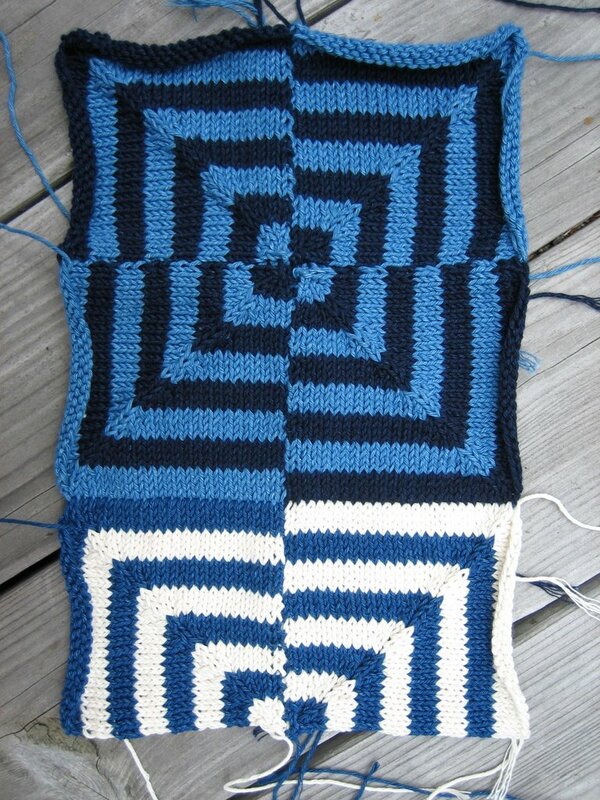 I'd love to do a Moderne Baby Blanket for my new nephew but the shoulder won't allow it - a quilt will be made instead. 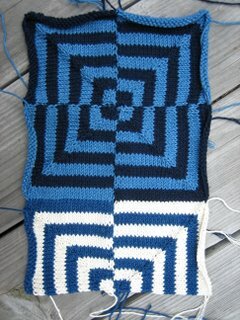 I was working on a Moderne Baby Blanket for my 3 year old, and I liked it so much I started another. We have friends who are having a baby next week, so I interrupted the pink blanket for a blue blanket. For being really cheap, TLC Cotton Plus really works for baby blankets! might see a giant pumpkin in October. I used Lily Sugar& Cream and it is about twice the size of the baby blanket pattern. makes your hands ache?...... absolutely! 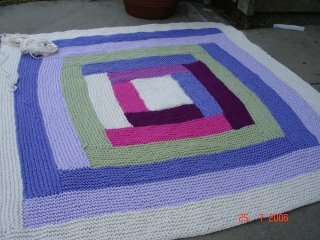 I'm having a brilliant time knitting this quilt. I have hardly put it down and as a result my back, fingers and hands ACHE but I'm ploughing on through the pain barrier! It's brilliant to see all the other projects going on. I just wish I could touch and buy some of the yarns you are all using. They look so beautiful. Has anyone else noticed that this book seems to evoke really strong reactions in people? Most people, members of this KAL obviously among them, really love it and often become peculiarly addicted to it. Yet I've noticed some people mentioning on their blogs that it drives them crazy, or just that they don't see the appeal. I find this really curious and interesting, and if anyone else is equally interested, I wanted to direct you to my blog, where I've just posted a long analysis of my own about it. I'd be interested to know what you all think. I've made a bunch of the warshrags (my mom and I find them totally addictive). 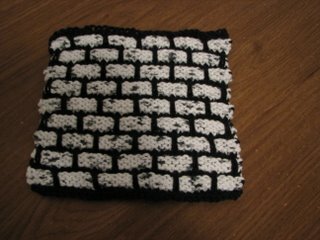 I always have one mindless project to work on while I am on the phone at work, so I cast on about twice the pattern repeats and made it into a hand towel for the kitchen. Had a big water spill this morning and the Peaches 'n Cream really soaks up like no tomorrow. We redid our kitchen for about $100 by refacing all the cabinets and painting, and adding some crown molding. This really gives it a nice touch of class. If any of you live in the midwest... Michael's is having a $1 sale this week on peaches 'n cream!